Harborfront 2 Condo - Bay Front on the Embarcadero! Private balcony on the bay. Garage Parking, Free WiFi, Full Kitchen. Sleeps 4. Beach-N-Bay Getaways is a professional management company based out of Morro Bay with homes in Morro Bay, Cayucos, and Los Osos. We love to share our knowledge of our homes to find the perfect fit for your group. Discover the difference that selecting a professionally managed home for your vacation can make with regards to amenities, upkeep and customer service before and during your stay. Trust your vacation to a PRO! As a value to our guests we include accidental damage coverage with every rental to avoid collecting a security deposit. This coverage is for unintentional damages to the rental unit interior that occur during your stay, provided they are disclosed to management prior to check-out. Conditions and limitations apply, contact us for full details. This wonderful condominium is in the BEST location you could possibly wish for! Located right in the Embarcadero (Morro Bay’s bayside commercial area), this vacation rental gives you the best of all worlds. When you walk out of this small complex you will have many restaurants, bars and shops available to choose from – all within a few minutes’ walk! But when you are in the condo, you will experience the quietness of the bay with only the occasional barking seal breaking the silence. The views are absolutely amazing and entertaining! Watch the sailboats bob up and down; see the kayakers glide through the water; observe the seals and otters and shorebirds as they play in their natural habitat. You won’t want to leave the deck! From the complex you will have access to a dock and a waterside walkway (future). The good news is that there are 3 condos available, all offering the same wonderful amenities, so if one is booked, don’t worry! You can reserve one of the other ones! This unit is on the upper level of the building and you have a shared garage to park in right outside the unit (please note garage clearance of 6’2", not all vehicles will fit in the garage, additional parking on the street). From the patio, you will have amazing views as you grill up dinner on the Weber barbeque grill and watch the sunset. •	Furnished with high quality, comfortable beds and furniture. •	Living room and bedroom are heated with energy-efficient gas fireplaces built into the wall, adding ambiance as well as warmth for your comfort. •	The bedroom has a queen-size bed, a large flat-screen TV and plenty of closet space. •	Living room also has a large TV and a comfortable sleeper sofa that makes into a queen-size bed. •	Full bathroom with a step in shower. NO SMOKING and NO PETS ALLOWED IN THIS UNIT. This property is managed by Beach-N-Bay Getaways, a company that manages only premium vacation properties. We take pride in the high level of cleanliness and maintenance that you will find in all of our homes. Our homes are finely furnished and decorated and offer many amenities such as fine linens, comfortable beds, well-equipped kitchens and all necessary consumable supplies. About Beach N Bay Getaways LEARN WHY WE ARE BETTER! Beach-N-Bay Getaways is THE SOURCE for Premium and Luxury Vacation Rentals located in Morro Bay, Cayucos and Los Osos. We are available 7 days / 24 hours a day to deal with any emergency or issues that might arise during your stay. We recommend that you review all our homes to find the perfect fit for your group. Every home we have in our inventory can be viewed on VRBO and other Homeaway sites. Stay with us once and you will discover the many ways we are different and the best choice for your vacation. View more about Beach N Bay Getaways LEARN WHY WE ARE BETTER! Easy walking distance to downtown Morro Bay and the Embarcadero is right outside the complex! 180 degree views of Morro Bay Harbor area. Amazing location right on the Morro Bay Harbor area. 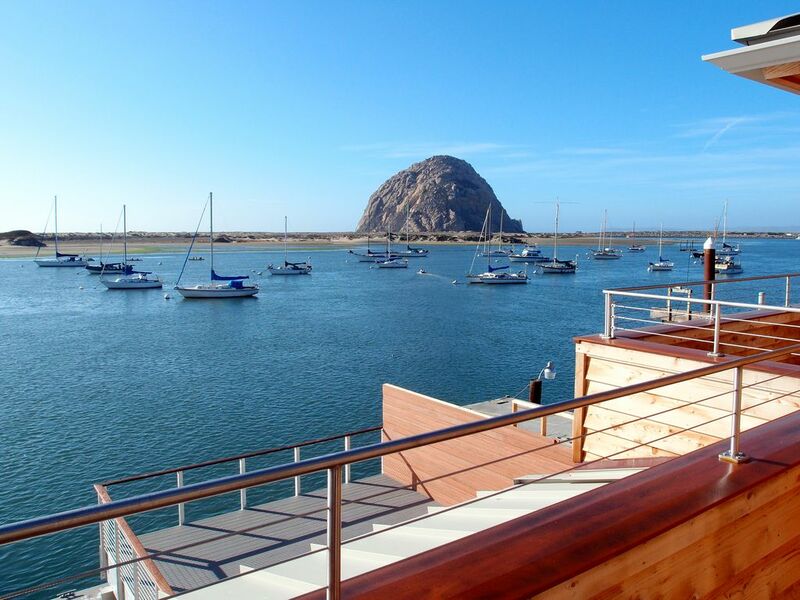 Enjoy the boats going by and fabulous views of Morro Rock. This unit is on 2nd floor. A first floor unit that is wheelchair accessible is available in complex. Well located space, check in with the numeric pad was easy. Kayak rentals directly down stairs. Great view and balcony. Clean and very organized condo, with everything needed provided. Simple and artistic decor. A really ideal place. The place was - just as advertised - clean, well furnished, high-end and quiet. The location - right on the harbor - lends itself to amazing views throughout the day and even the night. We have two teenage boys who comfortably slept on the pull-out sofa (no springs!) - without complaints for the first time :-). The nearby shops and general location was excellent - no commercial chain stores, huge variety of places to eat, all local, sustainable commerce. Highly recommended! Really cannot beat the location of this condo in Morro Bay. You're right in the thick of things, yet above it all, too. The deck is a cozy place to watch the boats and the birds and the lovely sunsets. Having the parking space in the garage downstairs was most welcome as that was one thing we never had to worry about. The condo is comfy and well appointed, with everything you need to be comfortable. I appreciated that light switches and remotes were labeled to make it easy. The queen bed is comfy with good bedding and there are plenty of nice, plush towels. My only nit to pick is that the full bathroom needs more places to hang towels - there's only one towel bar and one hook. That wasn't enough room for two and if we'd had three or four in the condo it would really have been a pain. We had a wonderful four days and can't wait to get back to Morro Bay. We'd happily rent this unit again. Such a wonderful spot! Beautiful view, excellently stocked and modern condo! Highly recommend. This area offers many activities and attractions including Hearst Castle (20 miles). Outdoor activities abound such as kayaking, deep sea fishing, hiking, biking, surfing. Morro Bay has many small boutiques, antique stores and art galleries when you are ready to shop. The central coast produces wonderful wine so wine tasting is a must do. There are several different wine regions - Paso Robles, San Luis Obispo, Santa Maria and some wineries nearer the coast. Holiday Periods: 3 night minimum. Check in 4pm, Check out 11 a.m.